ScoreKeeper Wants To Give You One Of Five Copies Of John Murphy’s THE LAST HOUSE ON THE LEFT Soundtrack!! Greetings! ScoreKeeper here with another soundtrack giveaway so horrifically terrifying – Hey, wait…where are you going? You don’t want to go that way. I’m warning you now, whatever you do, don’t go into the last house on the left. No, your other left. OK, but I warned you. Since you won’t heed my warning why don’t you do yourself a favor and enter to receive a copy of the soundtrack of THE LAST HOUSE ON THE LEFT (2009) composed by John Murphy. I’ve got five of them to give away and although you’re not likely to get out of the house alive at least you’ll have something to lose when you don’t. Email me at scorekeeper@aintitcool.com with the subject I’M LOST IN THE LAST HOUSE ON THE LEFT! Include your full name, mailing address, a valid email address, and a quick blurb about what you consider to be the scariest film score ever written. All entries will enter a cesspool where five winners will be randomly chosen. 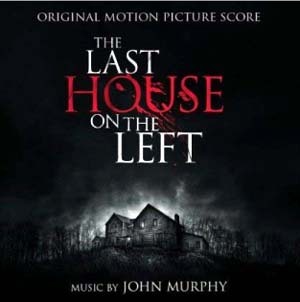 If you can make it out of the last house on the left and you’re name is picked then you’ll get a CD copy of John Murphy’s score for THE LAST HOUSE ON THE LEFT courtesy of the film music mavens over at La-La Land Records [www.lalalandrecords.com]. The deadline will be Wednesday, May 6th, at 11:59PM EST. The winners will be drawn on Thursday, May 7th, and then announced shortly thereafter. Only one entry per person please. Any duplicates will be discarded. International entries accepted. Have fun and enter today…the contest, not the last house on the left. OK. Really. That’s my final warning.